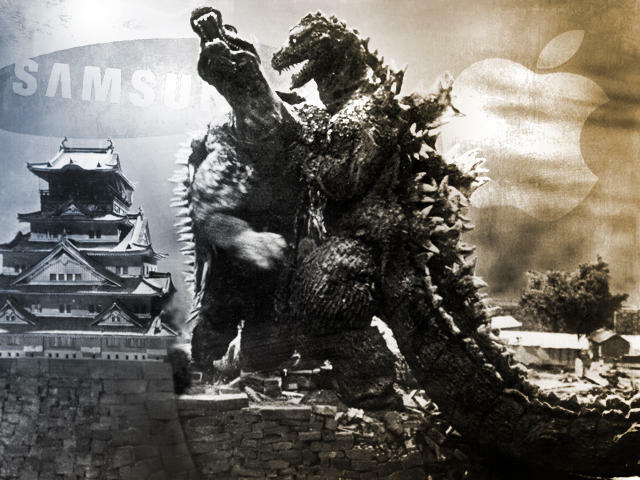 That sound you heard this morning wasn’t the roar of Godzilla stomping across Japan for the millionth time, but instead it was Apple letting loose its lawyers once again on Samsung. In what has become at least a weekly event as of late, the Cupertino-based company has filed yet another lawsuit against the Korean manufacturer, and this time they are set to do battle in the Land of the Rising Sun, Japan. The first hearing in the lawsuit was heard yesterday in the Tokyo District Court, and Apple is seeking an injunction on sales of both Samsung phone designs as well as the yet-to-be-released Galaxy Tab 7.7. Beyond the ban on sales they are also seeking damages of 100 million yen (approx. $1.3 million USD), which, due to the low amount, makes me suspect this is more about annoying Samsung than anything. Yes, they may have a case on the phones, but why go after the smallest version of the Galaxy Tab line as opposed to the 10.1 which courts in other countries have already agreed violates Apple’s patents? True, those other rulings should have no impact on what happens in Japan, but isn’t it going to be a bit more difficult to prove potential consumer confusion between a 9.7-inch device and a 7.7-inch device? Whatever the reasoning is behind Apple’s targets in this version of their ongoing fight with Samsung, I think we can rest assured that this is not the last of these lawsuits we’re going to hear about.